Sites mégalithiques de Carnac is part of the Tentative list of France in order to qualify for inclusion in the World Heritage List. To me, Carnac is the most important “missing WHS” for France. The site bears a unique testimony of the Neolithic period and possesses a tremendous variety of remains. It is definitely a must-see. The different museums in the area allow to better understand the site. I visited this tentative WHS in July 2016. It definitely deserves inscription as it is one of the best worldwide examples of menhirs, dolmens, tumuli, alignments and megalithic engravings in a relatively compact area. From June to August this site is certainly not off the beaten track and busloads of people visit every day. Due to the fact that most visit during this period, the main alignment fences are closed and one can only enter with a guided visit organised by the Maison des Megalithes (open 10:00 to 19:00) costing 6 euros. If you read up and prepare beforehand or simply if you miss the tour in English, I would suggest visiting before the crowds arrive at 10am and entering the minor free access sites. The surrounding fences are very low and do not obstruct the view of the alignments. I arrived by car at the Maison des Megalithes at around 9am and parked my car for free at the empty parking lot. I had previously downloaded the very good commentary from http://www.brittanytourism.com/discover-our-destinations/southern-brittany-morbihan-gulf/unmissable-sites/carnac and before arriving I bought some food to have breakfast while visiting the alignments. Firstly off I went and walked round the Menec alignments just opposite the parking lot. There are more than 1000 monoliths here, neatly aligned, and incredibly still coexist with a few houses which are inside the fenced off area! The largest monolith here is around 3.5 metres high and is believed to predate the Menec alignments. There are some monoliths which are either very close the fence or actually outside of the fenced area, so really if you want to get up close with the stones you don't have to visit with at least 50 other people herded from one alignment to the next. A minor road which leads to Auray separates the Menec alignments and the Toul-Chignan group which in actual fact must have been the same group. If time is on your side, walking or cycling from the Menec alignments to the Kerlascan alignments is a pleasant 4km one way along the D196. Make sure to bring a hat and lots of water though. Since I also wanted to visit the minor sites and the impressive sites of Locmariaquer and Gavrinis, I decided to move from one alignment to the next by car. Next, I visited the Kermario alignments which are probably the most visited due to their impressive size. At one end of the alignments there is a dolmen without its original cairn and at the other end is a lookout tower to be able to admire the seemingly never-ending alignments. The sheer size and number of monoliths is mindboggling. Here I stopped to enjoy my breakfast at around 10am and I noticed that a number of coaches were all heading towards the Maison des Megalithes so I was glad I the whole site to myself simply because I started my visit an hour before! Quite close to the lookout tower is the Le Manio group which is always open and is surrounded by trees. From here I drove down a narrow road to the Kercado cairn or tumulus (the signage says tumulus!). This site is within a private property belonging to an old lady who collects 1 euro from every visitor and gives a laminated A4 paper in English, French or German with some information. The site is worth visiting and if you look attentively, on the largest slab inside the tumulus you'll be able to see painted axes (similar to the ones I've seen in the Rock Art of the Mediterranean Basin sites I visited in Spain). Next I parked my car near a horse riding school and after a short walk under the shade of tall trees I visited the Manio quadrilateral and the Geant du Manio, the largest monolith of Carnac standing at around 6 metres high! Again, these sites are always open and are not fenced off. Next I visited the Kerlescan alignments towards the end of the D196 where I could clearly see thirteen rows of the best preserved menhirs before heading to the prolongation of this site which is called Le Petit Menec. The Prehistoric Museum in Carnac proper is worth a visit but if you have a car and enough time, make an extra effort and do visit at least the sites in Locmariaquer where you'll be able to see several dolmens but especially the special engravings and ornamental slabs just a few steps from the sea. There were quite a lot of similarities I could notice with other Neolithic engravings I've seen in Ireland and in Malta. Last but not least at lunchtime I visited the small island of Gavrinis (apparently only possible April to October with a guided tour, and July and August possible without a guided tour) which arguably has the best engravings and decorations. You have to bring your own supplies with you but you won't regret it. To visit you have to get on a short 15 minute boat trip from Larmor Baden and you'll have to allow around 2-3 hours. I hope that if the megalithic sites of Carnac get inscribed, the sites at Locmariaquer and Gavrinis get recognition too as they really warrant a complete and unique visit to anyone interested. The first time that I saw pictures of the Carnac stones was in a textbook at school and I was instantly fascinated by these enigmatic alignments. Many years later, when I came across the World Heritage list, I was surprised that Carnac was not included. It is on the French tentative list since 1996, but no efforts have been made to submit the site for final decision. So I was pleasantly surprised to find a recently launched website by the association Paysages de Mégalithes. 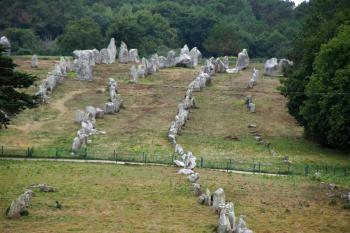 The association aims to protect and promote the megalithic sites in Carnac and Southern Morbihan. The description on the website reads: "Site protection and promotion work is designed to lead to a project to promote all of the heritage in the 26 municipalities in Southern Morbihan included in the research programmes, followed by an application to be listed as Unesco World Heritage." The website provides descriptions of about 30 of the more than 500 megalithic sites that are scattered across the region: dolmen, tumuli, menhirs, stone circles and alignments. But it is not mentioned which sites will be included in the final nomination, and also the sparse text of the T-list entry gives no detailed information. Probably it is not yet decided. 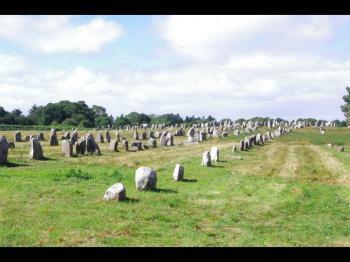 The Carnac alignments are undoubtedly the most spectacular megalithic sites in Morbihan. The complex consists of three groups of alignments: Ménec, Kermario and Kerlescan (from west to east). In total, there are about 3000 standing stones at a length of four kilometres, aligned in ten to thirteen rows. The alignments were erected between 5000 BC and 3000 BC, a more precise date can not be established, as there is no recent investigation using modern techniques. Originally, the complex was larger, but it was reduced in size over the centuries as stones were removed, now its original boundaries are difficult to identify. Apart from Carnac, three sites seem to be the most interesting: Locmariaquer and the burial mounds of Gavrinis and Le Petit-Mont. At least these are the sites where you have to pay an entrance fee. In August 2015, we visited Carnac, Locmariaquer, Gavrinis and some of the minor sites. But first things first: We arrived at Carnac in the early afternoon and went first to the 'House of Megaliths', the information centre at the western end of the alignments. The parking lot was almost full with cars and tour buses, most from France, but we saw also number plates from Germany and the UK. The beaches of Morbihan are popular tourist destinations, especially with windsurfers and sailors, and they all also visit the Carnac stones. The mass of visitors has long been a problem for the protection of the stones. Since many years, the alignments are fenced and from April to September the access is limited to guided tours, access is free between October and March. We booked tickets for the 4 pm tour to the Kermario alignment (6 euro per person). The starting point of the tour is about 2 kilometres from the visitor centre and we had plenty of time to explore the area on foot. Directly across from the visitor centre are the Ménec alignments. The fence is low everywhere, only one meter high and the complex is well visible. The Ménec stones are relatively small, most only one metre high or less. We walked on a narrow footpath between the fence and the main road that runs alongside the alignments. The stone rows are also intersected by roads in north-south direction, and we had to cross several streets and roundabouts on our short hike. The traffic affects the pleasure of the visit considerably. Maybe, it is possible to reduce or redirect the traffic, it is likely that ICOMOS will request improvements on this issue in the management plan. At least, the footpaths should be enlarged and extended. The guided tour started at the western end of Kermario group and covered about one third of the alignments. At Kermario are the largest stones of the Carnac complex, often more than three metres high. The stones become smaller from west to east, which applies to all groups of alignments. If you visit Carnac in summer, I would definitely recommend to take a guided tour, you get a much better impression of the site when you wander around the stones and have a closer look to the sometimes bizarre and mysterious shapes. The photo shows the Kermario alignments from the ruins of a windmill, which serves as a lookout tower. In the background the area, where the guided tour takes place. The Carnac stones are still mysterious, just like the people who built them. Several hypothesis about the purpose of the complex have been proposed. Certainly, the alignments had a spiritual meaning and were related to the dolmen and tumuli in the area, a kind of neolithic temple. But what exact function the alignments had, whether it was just a ceremonial place or also an astronomical observatory or calendar, and whether the distance between the rows and between the stones had a specific meaning, is controversial and unproven. Of course, also myths and legends emerged over the centuries, I like best the legend of Saint Cornely that says the menhirs were Roman soldiers turned to stone. Kerzerho alignments: about 7 kilometres north of Carnac, in the town of Erdeven. The area is much smaller than in Carnac, but freely accessible, some large stones, several metres high. There are numerous dolmen and menhirs between Erdeven and Carnac, e.g. a chair-shaped stone named 'Caesar's chair'. Tumulus Saint-Michel: in the outskirts of Carnac, the largest burial mound in Morbihan, with a chapel from the 17th century on the top. Currently, the burial chamber is closed due to restoration work. The Géant du Manio: in the forest between the Kermario and Kerlescan alignments, a 10 minutes walk from the main road. With 6.5 metres it is the tallest menhir at Carnac. Right next to it the Quadrilatère du Manio, an quadrangular enclosure, it was probably a burial ground. The second day we went to Locmariaquer, about 20 minutes from Carnac by car. The site consists of three monuments: the Grand Menhir, a huge monolith with an impressive lenght of 20 metres that has been broken into four pieces, the Er Grah tumulus and the dolmen Table des Merchand. The burial chamber of the latter is open for visitors, some of the stones are decorated with engravings. In the afternoon we visited the cairn on the small island of Gavrinis. We decided spontaneously to go there, after we had seen photos of the interior at the information center in Carnac and although it was quite expensive: 18 euros per person for the ferry and the guided tour (in French). It was a 40 minute drive from Locmariaquer to the port of Larmor-Baden. We were lucky to get the last tickets for the 3 pm tour. In high season it is recommended to book in advance, but it was very windy and rainy that day, so some tourists had cancelled their reservations. It was only a short ride with the ferry, the tour started with some general explanations, then our group of about 15 people was split for the visit of the interior. We passed the waiting time with strolling around the stone mound and reading the information panels (also in English). The interior was a real surprise, almost all stone slabs of the corridor and the chamber are abundantly decorated with engravings: curved lines, U-shaped symbols that look like animal horns, arrows, zigzag lines, snakes. There are nearly 30 stone slabs with well-preserved ornaments. The tour was very good, the explanations were detailed, and the guide also answered questions in English. We spent almost half an hour in the interior. We got torch lights, so the engravings were clearly visible, but it's not allowed to take pictures. In my opinion, the Carnac alignments are unique and outstanding and would be a worthy WHS, although megalithic sites are already represented. Probably some of the minor sites in the area will also be included in the nomination. Dolmen and menhirs can be found in many regions of Europe, but the number and density in Morbihan is astonishing. I have not yet visited other megalithic sites, such as Newgrange or at Malta, so it's hard to say whether the burial mounds in Locmariaquer or Gavrinis would be significant additions to the WH list. At least the number and quality of the engravings in Gavrinis seem to be outstanding. Morbihan is a bit off the beaten track for a World Heritage enthusiast. Other WHS - Mont Saint-Michel, Loire, Vauban - are more than 150 kilometres from Carnac, which is quite a lot in a well represented country like France. But it was a worthwhile detour and we enjoyed the two days that we spent between neolithic stones.